AC Milan host Juventus on Sunday night, and coach Gennaro Gattuso will be hoping for positive news on the injury front ahead of the weekend. His side are first in action against Real Betis in the Europa League on Thursday, but they’ll be hopeful of securing a positive result against the Serie A champions to preserve their place in the top four ahead of the international break. 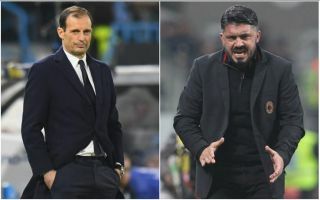 With that in mind, the Milan boss will hope for good news with regards to his injured stars, as Gonzalo Higuain was forced off against Udinese at the weekend while both Hakan Calhanoglu and Giacomo Bonaventura missed out with their own respective issues. Without that attacking trio at his disposal, Gattuso watched on as his side toiled in trying to find a breakthrough, with captain Alessio Romagnoli eventually stepping up deep into stoppage time to secure all three points. According to Calciomercato, there could be huge relief for Milan ahead of Sunday, as both Calhanoglu and Bonaventura are being tipped to recover in time to face Juventus, with the former potentially even in line to participate in midweek against Betis. However, there appears to be more concern over Bonaventura, and so time will tell if he recovers quickly enough to secure a place in the match-day squad. As for Higuain, Calciomercato add that the Argentine forward will not even travel to Spain due to his back injury, but importantly, it’s noted that Milan are confident that he will be able to face his former club at the weekend. After slipping to a defeat to Betis at the San Siro last month, the pressure is on Milan to get a positive result in Spain to ensure that they remain in a strong position to advance to the knockout stage of the competition. With that in mind, Gattuso will be hopeful that he has enough quality and depth at his disposal on Thursday first before worrying about the visit of Juve.